Hey there everyone! I hope you all are having a fantastic week. Can you believe we are already in mid-March? Baby girl is due in exactly 2 months, and time is flying by! I am so excited to meet her! She's been kicking like crazy lately, and is also preventing mommy from eating too much at one time. Which is why meals have been often and small. I've been getting crazy amounts of indigestion that have kept me up at night and leave me waking up extremely nauseous. Since my weight gain is below where my doctors want it to be, I am determined to still fuel my body properly by eating smaller, nutrient-dense meals throughout the day! I thought I'd write up what a typical day has looked like for me lately! 4:30/5am: I usually wake up between 4:30 and 5am naturally every day. I love early mornings and am quite motivated to workout, have quiet time with Jesus, pack a healthy lunch, and work on my business before heading off to my day job. Not everyone is a morning person, but I LOVE mornings and have decided that in order to be more productive, mornings are my most prized time of day. I seriously throw a party for myself every time I finish a morning workout...I feel so accomplished at 31 weeks pregnant!! 5:30-6am: Workout! I am doing the 21 day fix program right now mixed in with some kickboxing and other maternity workouts. I am loving moving my body and keeping myself health and (hopefully) in shape for labor! Sometimes, I have a quick toast before my workout if I'm feeling hungry! 6-6:45am: shower and then head down to make breakfast while packing our lunches! Sometimes, I have a Face time date with afellow coach from our team and we chat and have some tea while we get our day started! It's crazy how quickly you can connect and become such close friends with people you have met on social media! I absolutely love it! 6:45-7:15am: get dressed, hair, make up. I've been trying to spend more time in this department lately...I'm usually a super low maintenance gal, but trying to up my game a bit (I'm 28 years old, it's time lol). 7:30am: head off to work! I usually blend up my shakeo superfoods deliciousness at this point and take it with me to work! Helps start my day with a boost of nutrition, and chocolate! The best of both worlds. 8-4:30pm: work! I'm a renal dietitian at Davita, so work is full of educating patients, meetings with coworkers, and lots of charting! Today, I was at a new facility so I spent some time getting to know the staff and patients and getting used to the place! I also went on a short walk to get outside and get some sun. I try to go on walks on most days to keep myself a bit active. It's so easy to be glued to your chair at work, isn't it?? I also pack a ton of snacks and food with me at work to keep myself eating every 1.5-2 hours. At 31 weeks pregnant, I have been getting nausea and heartburn and find that if I eat smaller meals more often, my tummy is more settled! On this particular morning, snacks included hard boiled eggs and strawbs, followed by carrots, and then polished off by oatmeal bites! Shortly after these (I'm telling you, I'm eating almost every hour! ) I had lunch! Dolma is one of m favorite meals! 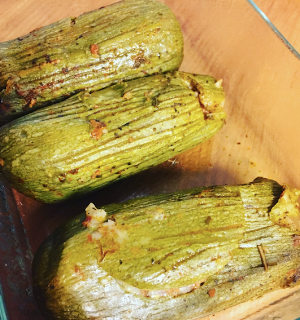 Stuffed zucchini with beef, rice, and spices! 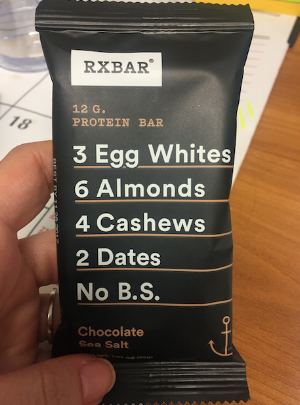 More afternoon snackage included an rx bar (recycled picture because I forgot to snap one!) and some nuts that I also forgot to snap a picture of. Sorry about that, friends! 4:30pm: When I got home from work, I was pretty tired but also felt like baking something delicious. I have been SO frugal with our grocery budget, but I was able to whip up this delicious chocolate chip oat bread! That I cut into bars, so I guess they are chocolate chip oat bars! Recipe coming soon! They were DELICIOUS, they are gluten free, and totally a healthy treat! 5:30pm: I had a busy rest of the evening, with a team video call with our coaching team, then heading off to a Mommy group I was invited too! I had a small dinner during our team call, which was rice, ground beef, and veggies that my grandma cooked up! Grandma to the rescue! 6:30-8pm: Soon after the video meeting, I headed off to the Mommy group. Can I be honest? Being a mommy excites me, but also scares me like no other! I want to make sure I do everything I can to make Emma feel loved and safe. It makes me cry just thinking about it. Going to the mommy group tonight was such a God-thing! They had a speaker come in who discussed everything from parenting to discipline to not passing down your own baggage to your child. It was great! There was also a legit dinner, since the dinner I had at home left me a bit hungry. SO I definitely didn't stick to my gluten free diet and indulged in pasta, a roll, veggies, salad, pound cake (MY FAV) and strawberries! Feeding baby is priority right now! The doctor DOES want me to eat more protein, carbohydrates, and healthy fats. Basically more of everything! Even though I feel like I've been eating SO much food, I am trying to shove a little more in here and there, even with the nausea and heartburn that has come on the past couple weeks! He specifically said not to fill up on junk, because we want GOOD nutrition to go to the baby! So I'm trying to feed myself good, wholesome food, while indulging a bit here and there if a craving hits. I am up 9 lbs from my pre-pregnancy weight, which is behind schedule, but I'm trying! Our next appointment is next week to check on her growth progress...prayers would be appreciated! 8:30-9pm: After the mommy group, I headed home to see my husband and prepared some ground turkey for us for the rest of the week. What a guy! He headed off to the gym and I cleaned up the kitchen a bit and packed my lunch for tomorrow. Packing my lunch took about 5 minutes, but now I'm prepared for tomorrow since I have to be at work crazy early tomorrow! Now, I'm just finishing up typing this post, then headed to bed for some reading, then sleep! Today was such a blessed day filled with a good day at work, good wholesome meals, and meeting a bunch of new, lovely people at the mommy group! I definitely collected on God's manna and blessings! Hope you all have a wonderful night too and get a chance to reflect on your blessings today!